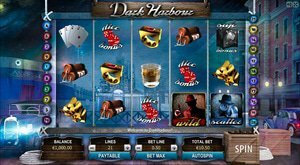 Several casinos are going to be debating the €100,000+ Dark Harbour Mega Jackpot, and this is generally considered to be one of the major developments of the year.The reason it is referred to as "€100,000+" is that this jackpot will start at that amount and continue to move upward. Yes that is an interesting piece of news. Gamescale is the software provider that has developed the Dark Harbour Jackpot, and it is one of the more ambitious projects yet for this company that has only been in operation since 2010. based in Malta, which has become well-known as a licensing jurisdiction for online gaming, Gamescale was founded between many veterans of the industry, and they came from backgrounds with some very prominent organizations, including Microgaming, Playtech and PartyGaming. They have developed relationships with other companies such as ECom Access and LivePerson to offer what, in their words, is "a complete one-stop shopping offering." They do indeed have a large assortment of offerings that cover the whole spectrum of casino games, including video slots, classic slots, video poker, table games, scratch cards and speciality games. Dark Harbour falls into the "video slots" category. It is based on an organized crime theme, to say the least. It is a five-reel game with 25 paylines, along with wilds, scatters and bonus games. The "wild" is very wild indeed, in that it is a gangster hit man wearing red. This substitutes for anything except scatters and bonus symbols in the process of completing winning combinations. There is another scatter - this one dressed in blue, and that symbol is the "scatter," which is instrumental in bringing prizes to the player when two or more appear on the screen. There are symbols for safes and dice too, and these are the ones that trigger the bonus game. Five of them have to show on the screen. Other symbols include ashtrays, whiskey tumblers, guns, cigars, gold bars and playing cards. In terms of the "regular" jackpot, the maximum is 10,000 coins. With the Mega Jackpot, this game now takes on a whole new dimension.